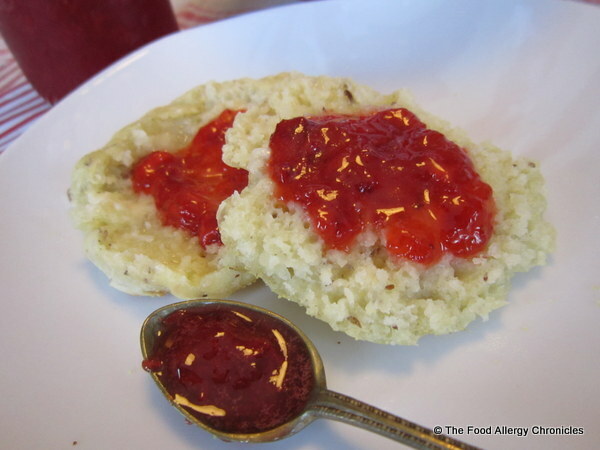 Posted on January 11, 2013 by Susan H.
What a treat…Dairy, Egg, Soy and Peanut/Tree Nut Free English Muffins with my favourite topping…homemade Strawberry Jam. Oh so yummy! Crispy on the outside with a soft, chewy, craggy inside…this adaptation of an English Muffin surpasses anything purchased in a package at the grocery store! 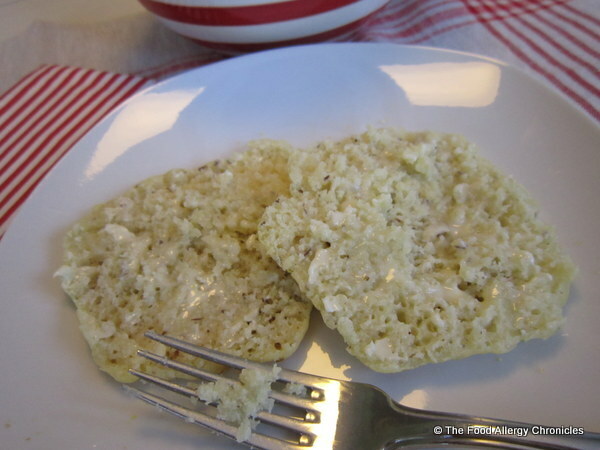 I couldn’t resist trying to adapt another one of Canadian Living Magazine’s December 2012 ‘Griddle Me This’ recipes…English Muffins. Click here for the original recipe. 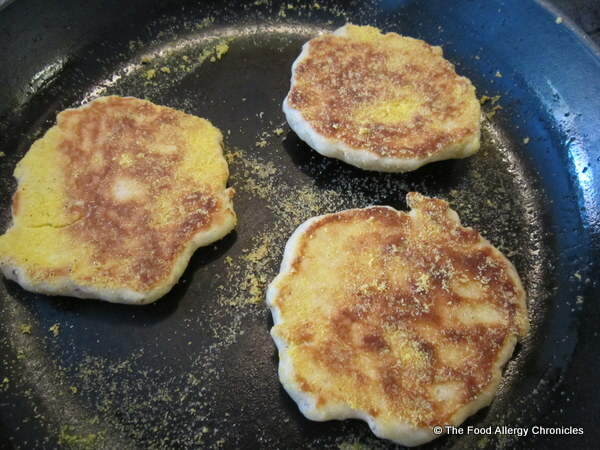 A bit time consuming…but when there are no other options for an allergy friendly English Muffin…one finds the time. Perfect for the weekend! Who wouldn’t want to wake up to the smell of a perfectly toasted Dairy, Egg, Soy and Peanut/Tree Nut Free English Muffin before heading off to school/work? I surprised the boys after school with the smell of my first batch of Dairy, Egg, Soy and Peanut/Tree Nut Free English Muffins cooking on the stove top and baking in the oven…my timing was perfect! Matthew perfectly pried open his Dairy, Egg, Soy and Peanut/Tree Nut Free English Muffin with a fork and spread it with a layer of Vegan Becel Margarine. Michael enjoyed his spread with Vegan Becel Margarine with the addition of a drizzle of his favourite topping…local honey. Andy enjoyed his toasted Dairy, Egg, Soy and Peanut/Tree Nut Free English Muffin for dessert…slathered with Vegan Becel Margarine and homemade Strawberry Jam. “This is really good!”, he exclaimed with a note of surprise in his voice. “This would be awesome as a breakfast sandwich!”, he announced excitedly. As Michael is allergic to eggs…perhaps a Peameal Bacon Sandwich? Delicious straight out of the oven yet perfectly wonderful toasted the next morning for breakfast, snack, or even dessert! 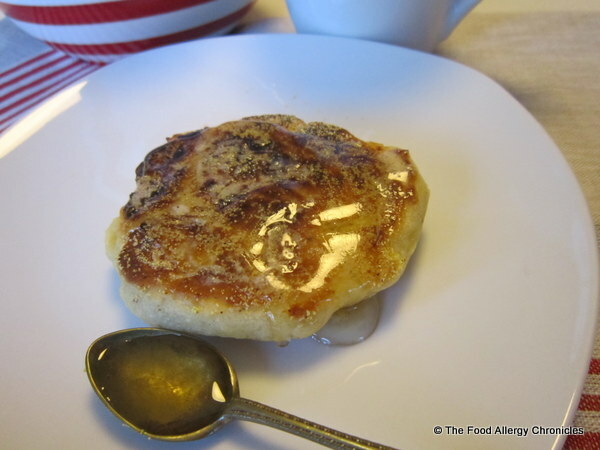 Dairy, Egg, Soy and Peanut/Tree Nut Free English Muffins are yet another great option for my teenaged son who arrives perplexed at the breakfast table every morning as to what to eat along with his Dairy Free Hot Chocolate. P.S. Between the Dairy, Soy and Peanut/Tree Nut Free Crumpets and the English Muffins…the English Muffins were the favourite. Michael is already hinting for me to bake up another batch! P.P.S: The link to the Canadian Living Magazine recipe for English Muffins is missing a couple of important paragraphs in their directions. Below are the missing paragraphs that start after the 1 1/2 hour rest period. “Mix baking powder with 1 tbsp water; stir into dough. Heat griddle or cast-iron skillet over medium heat; brush with some of the oil. 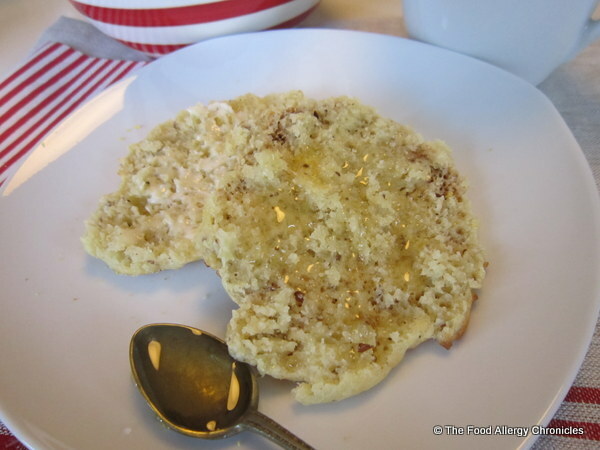 Sprinkle with some of the cornmeal. Drop dough by scant 1/4 cup onto griddle, leaving 1 inch (2.5 cm) between each. Cook until bottoms are browned, 7 to 8 minutes. Tip: Michael toasted his Dairy, Egg, Soy and Peanut/Tree Nut Free English Muffin whole…then pried it open to reveal a warm interior perfect for his toppings. He also tried toasting his English Muffin sliced. Andy toasted his Dairy, Egg, Soy and Peanut/Tree Nut Free English Muffin whole, without any slicing at all…he just spread the Vegan Becel Margarine and homemade Strawberry Jam right on top. Michael agreed that his father’s technique was the tastiest! Preferring honey to the jam. This entry was posted in allergies, baking, breads, breakfast, dairy free, egg free, multiple food allergies, peanut/tree nut free, sesame free, soy free and tagged Canadian Living magazine, Canadian Living Magazine's recipe for English Muffins Natur-a Soy Beverage, Dairy Egg Soy and Peanut/Tree Nut Free English Muffins, Natur-a Rice Beverage, Vegan Becel Margarine by Susan H.. Bookmark the permalink.